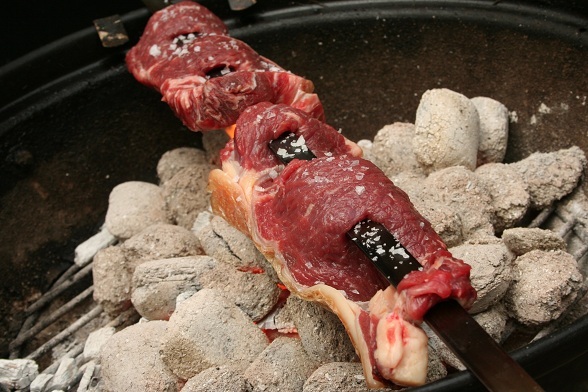 This is a traditional style of barbecue which originated from the gauchos (i.e. 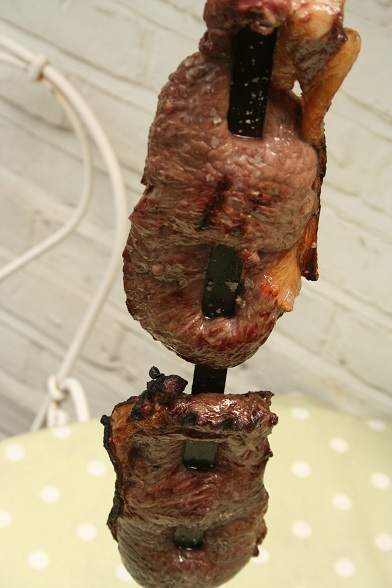 cowboys) in southern Brazil – meat on long skewers cooked over a barbecue pit and then sliced off with a knife. Not having a barbecue pit close at hand, we made do with a normal barbecue. Also not having a really long skewer at hand, we had to improvise. I had considered walking into a kebab shop and asking to buy a skewer, but a quick visit to B&Q yielded the “skewer” that you see in the pictures, which is also known by its more boring common name of something like “2mmx16mm rolled steel strip”. We simply seasoned the steak with a generous pinch of salt before cooking, which turned out to be all that it needed. As with the other steaks that we have cooked on the barbecue recently, it was a ribeye steak that we cooked quickly over high heat, which gave it a lovely char on the outside and left it pink and tender in the middle. Delicious. A very popular ingredient in this sort of barbecue is chicken hearts on a skewer, but we sadly failed to find a ready supplier of large quantities of chicken hearts. Maybe next time! In an effort not to eat a diet completely consisting of meat, we also had some sweet potatoes and salad. 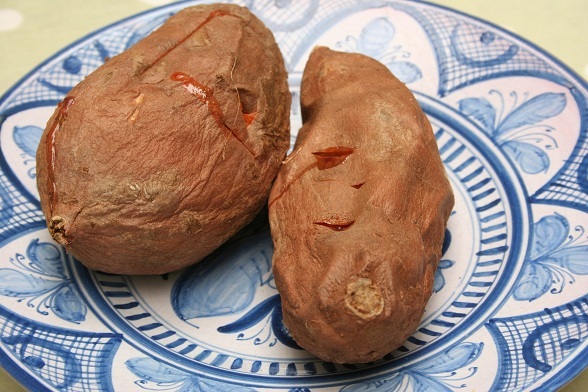 We could have been more authentic and cooked the sweet potatoes on the barbecue, but did them in the oven instead.